This week, instead of telling my students what we were going to make, I let them take a turn. 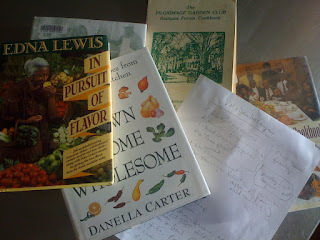 We sat around a cluster of cookbooks based on soul food, cajun and creole cooking on Monday, with my thinking we would use this opportunity to get into menu and “prep” planning. It turned into the unexpected, which is one of the reasons I was eager to jump into this job in the first place. The students not only learned that we can’t throw it all into a bowl on the last day and have everything we want ready to eat, but more importantly, that all this wonderful cooking they have wanted to do takes experience and attention to detail too. It brought up the subject on how much of authentic American cooking is at risk of being lost. We have so many recipes, but which one shows you how to make your own family’s version? You have to find out from your own family. One student in my 3rd period class took the reins on documenting a recipe with her family’s real macaroni and cheese, so we documented it while we made it. It allowed us to get beyond the “oh you just make it” and show ourselves the kind of detail one needs to know to effectively pass along a family recipe. When she saw the recipe in print (she chose the name “Smackin’ Mac N’ Cheese”), you could see her pride. It helped them also realize that while the exact measurements are not that important all the time, understanding how everything goes together so that it will turn out the way you want, is important. And that it is worth documenting. 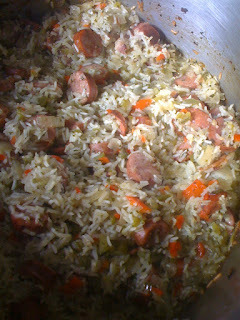 For my 2nd period class, we were again lucky, this time with one of our volunteers – she grew up in Louisiana and when she saw the Jambalaya recipe we chose, she offered to write up her own family recipe. Pure gold! Again, very simple, but it helped the students recognize the value of each of our family’s heritage and that sharing recipes is a common ground to relate to people we don’t even know very well. The meals? They came out well, perhaps not as well as if grandma cooked them, but this time, that made it even better.